UPDATE: I should clarify, I don’t think the Tea Party is so libertarian, in general, as this graphic illustrates. What it suggests is that there are unifying principles that could be at work here. But both fringes are looking at ways to use these phenomenas to pit the “right” side against the “wrong.” I’ve always wondered if there are compromises that could be had that don’t fit into any of the generally recognized political structures, but would work better than what we have now. I’ve never bought into the Tea Party as a grass roots movement; the legitimate anger & points made by many of its sincere members were co-opted almost from the beginning by the same politicians & moneyed interests their rhetoric would have included among the natural targets of their outrage. With both the Tea Party and OWC crowds, the worst thing you can say about them is that every charge and claim made for or against them is true, at least of some of their members. Outrage isn’t a plan, and without a plan, there’s rarely progress. Sage nailed it. Are there really people who still think the Tea Party represents some sort of genuine grass roots movement? If so, why are all the Tea Party candidates Republicans? They have been completely co-opted by the GOP machine, even to the point of including GOP social issues on their platform. The graphic is just partisan propaganda. I don’t know. No one forced me to go to one of the local rallies, and the local tea party groups here are often at loggerheads with the county GOP. Politicians are always going to try to cash in on any populist movement. They will follow the votes. It’s their nature. Perhaps the reason why all the TEA Party candidates are Republicans is that the TEA Party is a grass roots movement of those on the libertarian-right. The OWS gang, on the other hand, is a grass roots movement of the left and anarchist-left. If they were to produce political candidates, they would most likely run under the Democrat (or Green) banner. Both ends of the political spectrum have grass roots. It’s true that outrage isn’t a plan, but it can provide the emotional fuel for a movement. If such a movement is led by men with a plan, change will occur. For examples, consider the British colonies in North America in the late 18th century or Russia in 1917. If you accept the one quick-and-dirty definition of “libertarian” as being “economic conservative and social liberal” I have never detected any intersection of libertarianism and the Tea Party at all. The Tea Party talks a swell fight on economic conservatism, but if anyone in it embraces social liberalism they certainly are keeping their mouths shut. But then, I see many people being described as “libertarian” who never would have been by the standards I was familiar with 20 – 25 years ago, and it seems the word has evolved into something I no longer recognize; in fact the beginning of that evolution is why I drew away from the libertarian “movement” years ago. By the same token I don’t see very much in the OWS movement that would suggest economic conservatism, so again no intersection with libertarianism as I once understood it seems possible. Always “politically homeless,” I guess. 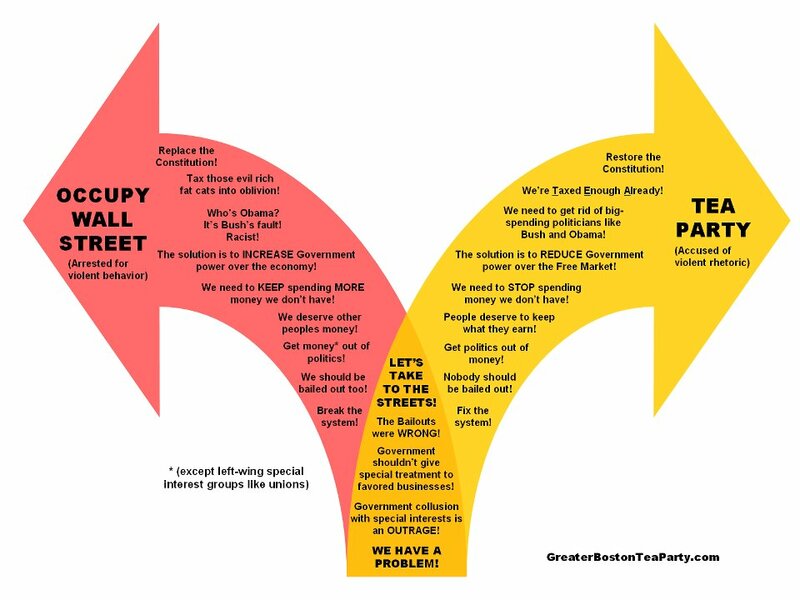 My simplification of the graphic is that the people on the right arrow pay the taxes while the people on the left arrow generally do not.